Malaysia’s Petronas has achieved first gas from its first floating liquefied natural gas (FLNG) facility, PFLNG SATU earlier this week (14 November) from the Kanowit gas field, offshore Sarawak. 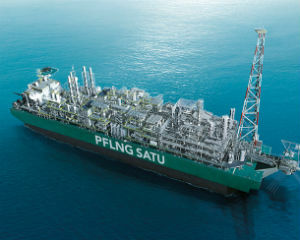 Image of the PFLNG SATU, from Petronas. The introduction of gas from the KAKG-A central processing platform at the field ignited the PFLNG SATU flare tower at the height of 130m, proving the technological aspirations of Petronas to unlock gas reserves in Malaysia’s remote and stranded gas fields, the company said in a statement. PFLNG SATU made its 2120 nm journey from Okpo, South Korea to the Kanowit gas field on 14 May 2016 for its offshore phase of commissioning, which Petronas anticipates will soon progress towards commercial operations and first cargo. The PFLNG SATU, fitted with an external turret for water depths of between 70-200m deep, will extract natural gas via a flexible subsea pipeline for the liquefaction, production, storage and offloading processes of LNG at the offshore gas field. “We have come a long way with our partners to deliver a game changer in the global LNG business. The shared vision for PFLNG SATU to monetise gas resources uneconomical to develop via conventional means is an achievement all can be proud of,” said Adnan Zainal Abidin, Petronas acting VP LNG assets, development and production said. This entry was posted on Sunday, December 25th, 2016 at 6:46 am and is filed under Malaysia, oil and gas. You can follow any responses to this entry through the RSS 2.0 feed. You can leave a response, or trackback from your own site.